Love and Happiness: Brainwaves, sleep, etc. This is a blog that has been sitting on my laptop for ages now. I keep going back to it and adding little bits and then closing it down – only to come back to it later. All of the blog in italics is from various neurological sites that I put together to give an overview of the different brainwaves. I used to discuss this (although it was a much simpler version) at my meditation workshops for Breast Cancer Care. We’d discuss how stress creates problems in the body. What triggered me into remembering it again last week was the statement by a patient that she is not stressed, as she has no reason to be. Personally I also have no reason to be stressed but to a degree I am. We all are. We are constantly bombarded not only by EMF, radiation, noise pollution, fast pace of life, worries about family, friends, job, lifestyle, etc. I could go on forever about what stresses us. How can we not be stressed? Over the last few days I’ve been nudged to upload it, but being slightly sleep deprived myself, I’ve not had the energy to do so. I wanted to run this by our EEG technician, but when I discussed the possibility of tying it in with energy work, he sorta went blank on me. Ookay…so as a respiratory technician I am attempting to do an explanation that an EEG technician would know heaps more than I do about. I have touched on a lot of this in my job but as I specialise in breathing, I am not a complete fundi. So I am keeping it very plain and simple…bear with me to the end when I give an explanation for the longwindedness of this blog. When we turn off the lights and close our eyes, our brainwaves will descend from beta, to alpha, to theta and finally, when we fall asleep, to delta. Beta when we are consciously alert and actively talking, or when we feel agitated, tense, afraid. 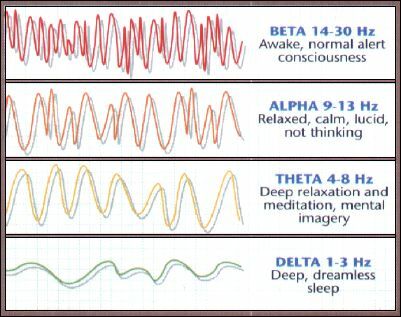 These beta waves are the fastest of the four brainwaves. Reading a book in bed before sleep slows the beta waves down, making it easier to slip into the next state. Alpha when we are in a state of physical and mental relaxation, although aware of what is happening around. A person who has completed a task and sits down to rest is often in an alpha state. Theta is a state of somnolence with reduced consciousness. An example is daydreaming, meditation or a person who is driving on a freeway enters a ‘zone’ of calm lucidity. This state allows for a free flow of ideas about yesterday's events or to contemplate the activities of the forthcoming day. This time can be an extremely productive and can be a period of very meaningful and creative mental activity. This is also when we dream. Delta when there is unconsciousness, deep sleep. Humans dream in 90 minute cycles. When the delta brainwave frequencies increase into the frequency of theta brainwaves, active dreaming takes place and often becomes more experiential to the person. Typically, when this occurs there is rapid eye movement, which is characteristic of active dreaming. This is called REM. It is during REM sleep that people generally dream. Non-REM sleep is important because it gives the body a chance to physically restore and heal itself. REM sleep seems to help the mind restore itself. Disorders of REM sleep include not getting enough of it, as well as a condition called REM sleep Behavior Disorder, or RBD, in which the body acts out the things going on in dreams. SYMPTOMS: A person lacking REM sleep will show all the general symptoms of sleep deprivation, such as reduced productivity in the workplace, daytime sleepiness, and not handling stress well. Losing REM sleep makes people more sensitive to pain, too. In addition, REM sleep seems to be necessary for verbal skills. A lack of it will cause a person to not be as creative in using language, and they will not do too well on language tests. Normally a person will be somewhat paralyzed during REM sleep. In cases of RBD, the paralysis is not there. These patients act out their dreams, sometimes leaping out of bed or punching their sleeping partner. In general, we are accustomed to using the beta brain rhythm. When we diminish the brain rhythm to alpha, we put ourselves in the ideal condition to learn new information, keep fact, data, perform elaborate tasks, learn languages, analyse complex situations. Meditation, relaxation exercises, and activities that enable the sense of calm, also enable this alpha state. According to neuroscientists, analysing electroencephalograms of people submitted to tests in order to research the effect of decreasing the brain rhythm, the attentive relaxation or the deep relaxation, produce significant increases in the levels of beta-endorphin, noroepinephrine and dopamine, linked to feelings of enlarged mental clarity and formation of remembrances, and that this effect lasts for hours and even days. It is an ideal state for synthetic thought and creativity, the proper functions of the right hemisphere. As it is easy for the hemisphere to create images, to visualise, to make associations, to deal with drawings, diagrams and emotions, as well as the use of good-humour and pleasure, learning is better absorbed if these elements are added to the study methods. But these aren't really "separate" brain waves - the categories are just for convenience. They help describe the changes we see in brain activity during different kinds of activities. So we don't ever produce only "one" brain wave type. Our overall brain activity is a mix of all the frequencies at the same time, some in greater quantities and strength than others. Balance is the key. We don't want to regularly produce too much or too little of any brainwave frequency. We need both flexibility and resilience for optimal functioning. Flexibility generally means being able to shift ideas or activities when we need to or when something is just not working. I have heard that there is another wave called gamma - which some seem to associate with unity consciousness. I don't know anything about it so I cannot comment. So now on to why this is being blogged about. As a respiratory technician I observe people’s breathing as they sleep. When they enter the Delta state the whole body relaxes completely. 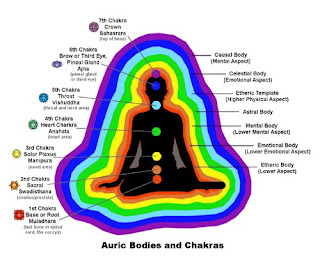 We all know that there are subtle bodies or energy fields that surround our physical body. The first one is the etheric body which contains the blueprint of our physical body, then there is the emotional body, then the mental body. I will stop there as these are the three I want to concentrate on. When we have a trauma there is an emotion and corresponding thought form that goes with it or depending on your view there is a thought form and corresponding emotion. It doesn’t matter how you view it. You cannot have one without the other. When you clear the emotion the thought form is far easier to change. We carry all our traumas over into our new body each time we incarnate. The negative thought form will sit in your mental body and the negative emotion in your emotional body. As we add similar traumas to these two, they grow until they finally encroach in the etheric body that surrounds your physical body. This is when the illness or problem is created within your body as a physical manifestation. Again, this is an over simplified explanation. The body itself is perfect. It is all we experience and hang on to that distorts it slightly. Thus in my job I see those that have difficulty breathing at night. And it is not merely overweight people. I am talking about slim, young and old. On Sunday I was lying next to hubby listening to him breath. He was going into the theta state and I could hear his throat relaxing and therefore slightly obstructing. When I say obstructing…try lying on your back and drifting off into sleep, you will feel your throat relaxing and becoming smaller. It is worse if you have a cold. There have been occasions when full of cold I have heard myself almost snoring and hubby says that I do funny little snorts then. In this ill state our body's functions are distorted. There are certain forms of breathing where you restrict your throat so that your breath hits the back of your throat and helps to get you into a certain state. Hearing hubby’s slightly restricted breathing in the theta state reminded me of this breathing. Which got me to thinking that the body knows what it needs to do to get into a certain healing relaxing state and yet with all the distortion caused by our negative emotions…it cannot do it properly. Another state that I have personally experienced is that of the no breath. When we go very deep into Delta state our body shuts down and we breathe so shallowly as it works on healing itself, concentrating all our energy on those parts that need to be worked on. When we go into this very deep state whether sleeping or meditating that is when we only take in enough breath to keep us alive. If you look at a sleeping baby who is so still you wonder if they are alive – they are in the delta state. So again the body knows what it needs to be but for some it is distorted so that they land up not breathing at all. I understand that for many it is the physiology such as overweight people the pressure from the weight on the throat and the lungs that cause them to stop breathing. But carrying weight is all part of stored traumas. For others it is the shape of their face, etc. but again this is all part of the stored trauma. If we carry over emotional traumas from each life time and we have not resolved them, it will impact on the body created. The body itself also has cycles of incarnation to go through. So all in all it makes for a fascinating study of science and energy. Wonder if there is anyone out there who is doing the ‘proper’ research? The body is far more clever than we give it credit for. It knows what it ‘should’ be doing, but can’t always do it because of the crap we carry with us. It makes for a heavy load for the body to haul around each lifetime. And finally, sleep is so important. In this day and age it has been ignored. We are told that if we sleep we are lazy. How many ‘go getters’ work long hours and take their work home with them and then constantly worry all night. I have had many a businessman spend a night at the unit unable to put their ‘work’ down and actually go to sleep. One of them actually left his Blackberry on in case - and kept getting messages that interrupted his night of sleep. I had to go in there and lay down the law. He called me Nurse Ratchett :-). I suppose he had his answer then and there – he ‘can’t sleep as there is too much to do’ and he refuses to switch off. Constant interruption of our sleep pattern over long periods of time, for whatever reason, causes problems in our health. Firstly, because we don't receive that deep rejuvenating and regenerating sleep that is needed when our body heals itself. Secondly, there is an adrenaline surge created that brings us out of the deep sleep so that we are ready for flight or fight. What happens to the adrenaline that we have through our normal every day stresses and possibly all night if we are constantly woken? Most of us are not using the adrenaline because we are not fighting or running. So it floats around in the body without release and causes havoc. How sad that we cannot take time out from our rushed lives to actually enjoy sleep…or for that matter fun. We need to listen to our body and sleep when it asks for sleep because in the long run...after months or years of ignoring the requests that our body makes...will be detrimental to our health. The alternative is to 'power nap' or meditate briefly, but obviously nothing replaces a good night's sleep.